Carnival Corp said yesterday they are going to more than double the number of ships on which they plan to install scrubbers that will clean the ship’s exhaust to remove pollutants, including sulphur, so the sulphur content is 0.1% or less. The company had planned to add the scrubbers to 32 ships (announced last September), but yesterday they said they were increasing that number to at least 70. Although there hasn’t been much said on this side of the Atlantic, yesterday, TUI Cruises took delivery of their first newbuild, Mein Schiff 3. CND subscribers also read about shopping until you drop and then you can cruise. Photo courtesy of STX Finland. All rights reserved. May not be copied or used without permission. CND subscribers also read about the Sapphire being Shanghaied ... and waiting for a mug shot. 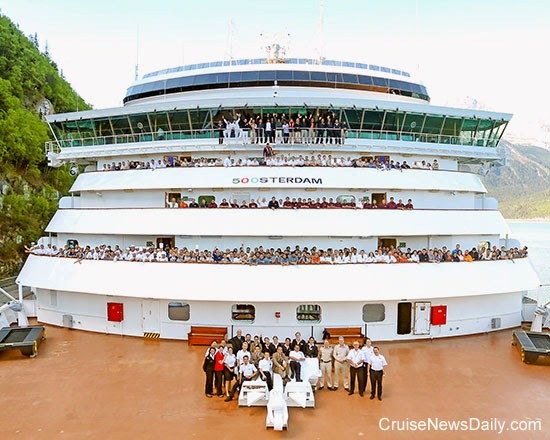 The crew of Holland America's Oosterdam marks the ship's 500th sailing. Seattle, Wash., May 22, 2014 — Holland America Line was named the 2014 Marine Environmental Business of the Year by the Port of Seattle. Port commissioner Courtney Gregoire presented the award to Keith Taylor, senior vice president, fleet operations, at the Seattle Propeller Club’s Maritime Festival Lunch held Tuesday, May 13, 2014, aboard Carnival Miracle, which was docked at Port of Seattle. The cruise line was recognized for its efforts to reduce its global environmental footprint through a series of objectives that greatly reduce consumption of fuel and water, engine emissions and generation of solid waste, along with increasing recycling across its fleet of 15 ships. Holland America Line also was named Environmental Business of the Year in 2010 and this year received the highest level of the Green Gateway Partner Award from the Port of Seattle in March 2014 for its use of shore power and comprehensive practices to reduce emissions. Every year Holland America Line sets goals and targets for its fleet that include decreasing fuel consumption, conserving energy, reducing the loss of refrigerant gasses, increasing recycling and decreasing water use. 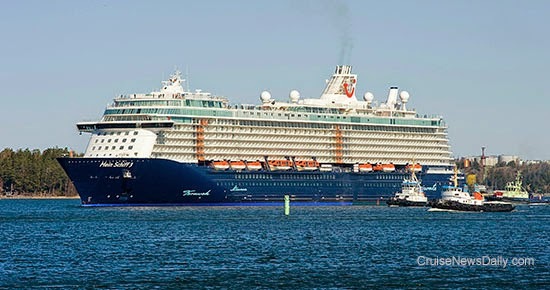 The only cruise line recipient of the Rear Admiral William M. Benkert Environmental Protection Award from the U.S. Coast Guard in 2012, Holland America Line’s ships meet or exceed all provisions of the international regulations governing the environmental management of marine operations. But the company aims for superior environmental performance while operating responsibly via a firm promise to reduce all forms of pollution through improved policies, scientifically sound practices, consistent training of employees and innovative technology. The company is among the pioneers in the maritime industry when it comes to investing in technology to reduce engine emissions while a ship is at berth. Six of the 15 Holland America Line ships — ms Amsterdam, ms Veendam, ms Noordam, ms Oosterdam, ms Westerdam, and ms Zuiderdam — use shore power at the ports of Seattle, San Diego and Port Metro Vancouver. Holland America Line has a partnership with Marine Conservation Institute, a globally focused nonprofit organization based in Washington State dedicated to maintaining healthy, living oceans. The program includes guest and staff education, funding for marine conservation biology research, and a sustainable seafood program with environmentally responsible purchasing practices and menus that showcase sustainable seafood. Holland America Line ships have been sailing from the Port of Seattle since the early 1970s. In May 2002, Holland America Line began using Seattle as a homeport for Alaska cruises. This year the company has two ships based in Seattle sailing 32 Alaska cruises from May through September. MIAMI (May 22, 2014) -- Carnival Cruise Lines has made two exciting enhancements to its West Coast cruise operations, deploying two highly attractive Spirit-class ships featuring a variety of Fun Ship 2.0 innovations as well as a huge number of balcony staterooms. 7:22 am EDT - MSC Crociere and Fincantieri today announced an order for two new cruise ships which will be the largest the Italian builder has ever produced. The order includes an option for an additional ship. The 154,000-ton vessels are scheduled for delivery in November 2017 and May 2018. They will have a length of 323 meters and width of 41 meters. The ships will contain 2,070 passenger staterooms and suite with a maximum occupancy of 5,300 passengers and 1,413 crew members. The complete story appeared in today's edition of Cruise News Daily. Renderings courtesy of MSC Crociere. All rights reserved. When Quantum of the Seas ends its now-limited run in New York next May, Royal Caribbean earlier announced its new home port would be in Shanghai. In the intervening week, they have left the intriguing question open of how the ship will get there. They answered that question yesterday when they released the ship’s itinerary and opened it for sale to past passengers, and it will open to the general public tomorrow (May 22). The line is sending it on a 53-day eastbound Global Odyssey via the Atlantic Ocean, Mediterranean Sea, Arabian Gulf and Indian Ocean. Norwegian Cruise Line said today they are expanding the booking window to pre-reserve specialty dining and other options, doubling the previous window. The long-awaited tunnel to the Port of Miami officially opened on Monday, although it is still to be opened to regular traffic, but that will happen any day now, as soon as final inspections and tests are completed. For those driving to the port via the area’s expressways, it will be a shortcut directly into the port. Norwegian Cruise Line announced a new $250 million initiative today that updates Freestyle Cruising to the “NEXT” level. It will bring many of the new features introduced on Norwegian Breakaway and Norwegian Getaway to the rest of the fleet. Sunday evening about 6pm (local time) Costa Deliziosa experienced a power outage while it was docked at Valencia (Spain). Costa says that technical personnel began work immediately and within a “few hours” power was restored. The ship, however, did not leave Valencia while work continued to repair the source of the problem. That resulted in cancellation of the balance of the itinerary along with a modification to the next sailing. CND subscribers also read about things being larger than they seem ... and walking around the yard with the executives. The entire crew of Regal Princess at delivery of the ship with president Jan Swartz at the center. 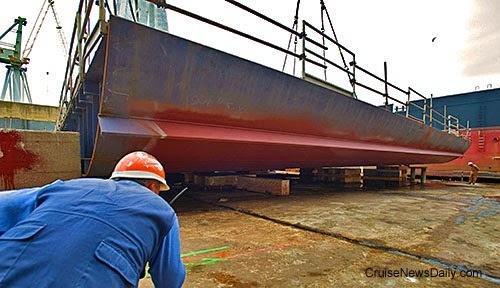 It's less than six months before Meyer Werft delivers Quantum of the Seas to Royal Caribbean, and the executives the ship is coming together and beginning to look like the finished product. Most of the work to be done now is finishing work, and the Royal Caribbean executives are walking around the covered building dock at Papenburg sharing their impressions. The Australian source market is continuing to grow, and Carnival said this evening, they are moving to match that growth by transferring two ships from their Holland America brand to their P&O Australia brand. Ryndam and Statendam will begin sailing for P&O Australia in November 2015. Disney Cruise Line revealed today what Disney Wonder will be doing during the fall of 2015 after its summer Alaska season ends. The ship will have several short series of cruises to or from ports that have been in high demand by Disney fans. In December we told you about MSC’s plan to stretch their four Lirica-class ships. Then in February we told you about the start of the actual project when Fincantieri began cutting steel. It’s now May, and the yard is starting to put that steel together. 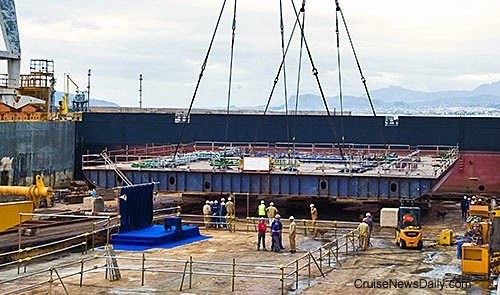 At their Palermo yard today, Fincantieri laid out the first block (of four) that will make up the new midsection to be inserted into MSC Armonia during a ten-week dry dock beginning on August 31 at the Palermo facility. 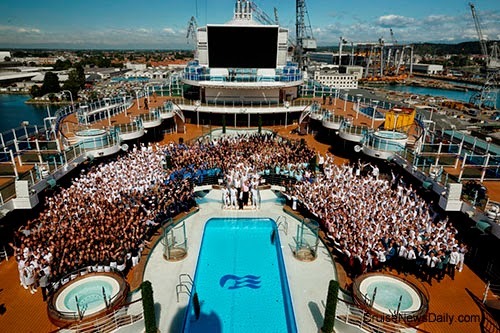 and the ship's volume by 5,000 tons, with 193 new staterooms and 59 new crew cabins. Update May 19 - Costa has decided to terminate the voyage and is finalizing plans to fly passengers home. Updated compensation plans have not yet been finalized. We will have further details on Tuesday. Genoa, May 19th 12.30pm - Costa Crociere confirms that on Sunday 18 evening around 6pm LT while she was berthed in Valencia as per her planned itinerary, Costa Deliziosa experienced a technical failure which impacted on timing of scheduled departure. Guests on board were duly informed and at no time was the safety of the ship or the Guests ever put at risk. The technical personnel intervened immediately and after few hours restored the electrical power supply and all essential services. All the relevant authorities have been promptly duly informed. The causes of the technical problem occurred are still under investigation and specialized technicians are on site. Since safety is Company’s number one priority and in order not to expose our guests to unacceptable delays and additional discomfort given the required timing for fixing the problem occurred , the company has offered to Guests on board alternative complimentary shore activities for today May 19 in Valencia. Moreover Costa Crociere is on site through its appointed Care Team to providing full assistance and reduce guests discomfort as much as possible. In addition the Company has also planned return charter flights to Rome and Genoa for Tuesday, May 20 for those guests supposed to disembark ending their cruise. Special re-protection plans have been put in place, in order to let Guests to reach the final destination or hotel, on the basis of special individual needs. Costa Cruises is deeply sorry for what has occurred and will recognize to guests on board Costa Deliziosa a refund of 50 % of the cost they paid for the cruise and a credit of 100 € per person on the expenses incurred on board (and the complimentary shore activity in Valencia May19). Guests on board are appreciating the extension of call in Valencia offered by Costa and the atmosphere on board is calm. Costa Crociere is also informing future guests supposed to start the cruise in Civitavecchia on May 20, that Costa Deliziosa will not be able to embark them on the scheduled timing (May20). The company is intensively working to set alternative options to make sure its guests can still enjoy their planned holidays through an appropriate solution, which will be fixed and communicated over the next hours.